What is this? A motion board or a balance board? Technically it's both. Balance boards allow you to balance at your desk, but motion boards encourage more movement than balance alone. 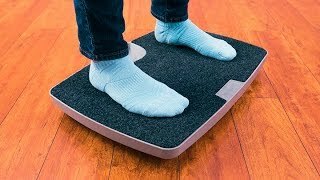 Our Fit Motion Board helps you find a greater movement than you can get from standing in place or balancing on boards with less tilt. To use the Fit Motion Board, set it on a stable place in front of your workstation and take a single step up onto the board. After you get used to the board's points of balance, take another step up with the other foot. Make sure you're holding onto a surface as you get used to the board. Practice standing and balancing on the board for a few minutes before you start tilting, and when you feel like you have your balance down, you can start moving more. Absolutely. While sit/stand desks are the cornerstone of an ergonomic workspace, the overall goal is to add more activity to your day. The Fit Motion Board contributes to your health by allowing you to balance, move, and switch up postures throughout the day. What is this board made out of? The deck is constructed from polyurethane, steel, and rubber. The dome is made from polyurethane. It is sturdy enough to hold up to 350 pounds. Is the felt padding made from plastic or wool? Our Fit Motion Board comes with a comfortable wool felt padding on top for additional anti-fatigue support.